The story is told of a young man who, out of his own earnings, bought his first racing bicycle. He learned soon after that a race was to take place in his city, and he decided to enter the race. His father dissuaded the young man, telling him that bike racing is a sophisticated sport and he had not undergone the proper training to compete. But the young man countered that no matter how it would end, the experience would be good for him. Disregarding his father's advice, the son paid the fee and registered as a racer. When the young man returned home from the race, the father was preparing to welcome him with "I told you so," and to console him for losing. INstead, he was greeted by a young man who was grinning from ear to ear. The young man announced that he had won the race! The astounded father asked his son how he managed to beat so many experienced racers. The young man replied, :When I arrived at the race, I overheard the guys talking about timing, pacing, and making your move at the right time. I realized then that you were right - I didn't know much about racing. So when the race began, I just pedaled and pedaled and pedaled as fast as I could, and no one was able to overtake me." The young man was powered by the excitement of his first race. He was not held back by the fear of losing. He won because he trusted his hopes, not his fears. The Word of God today tells us of two women who trusted their hopes and their God rather than their fears. Both women are barren. The Jews consider children a blessing and the highest form of wealth. Conversely, barrenness stands for lifelessness, the absence of God's blessing, or a consequence of sin. Though suffering the shame of being barren, the two women keep their hopes in the Lord who never forsakes the faithful and loves to spring surprises that bring new life and direction. God's finger works for these two women to fulfill their hopes. The first woman is not even named; she is the wife of Manoah. 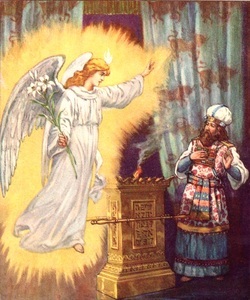 An angel of the Lord appears to tell her that she will have a son, In due time, the woman bears a son and names him Samson. The child will grow up to be a great leader and champion of Israel. The other woman is Elizabeth, the wife of Zechariah. She is barren and, like her husband, advanced in years. But by God's graciousness, she bears a son. Her child John will grow up to be the forerunner of the Messiah. 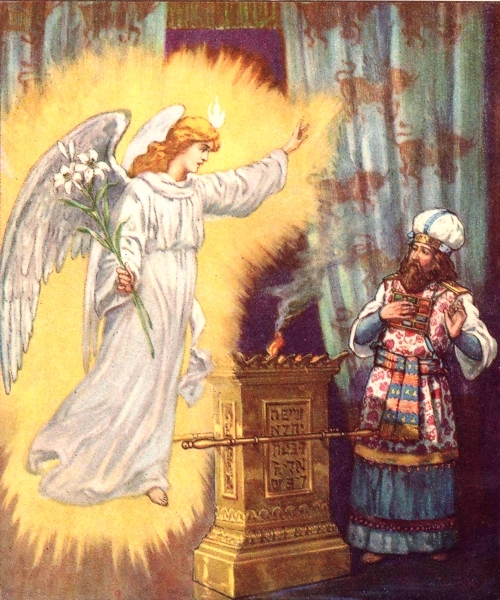 Zechariah is struck speechless, but Elizabeth praises the Lord for having seen fit to take away her disgrace people. Life is full of surprises. Sometimes the surprises are pleasant - passing the board exams, getting a job promotion, or even winning the Jacpk pot in lottery. At other times, they may be difficult to take - death in the family, terminal sickness, or loss of job and property. We are often at the point of giving up; we have tried everything, nothing works, and there seems to be nothing more that we can do. The Word of God today reminds us that God's ways are not our ways. We have a God who loves to surprise us. "Just when we've given up on a long unanswered prayer, he sends the answer in a way that knock the breath out of us," says Fr. Johnny Go, SJ, "Just when we've decided to bury a long-frustrated dream, he rolls the stone away and resurrects the dream in ways we never imagined before." Let us then trust our hopes and our God. Let us open our hearts and our hands to God's surprises in our lives and in our world - this Christmas and each and ever day of the coming year.